Huge Name Added to Heavy Metal Thunder Taping! 61 Kinder Dr, SATX, 78212! Join us for a free taping of #HeavyMetalThunder TONIGHT, featuring the #HeavyMetalWrestling debut of an extra special guest – JONATHAN JOSS! 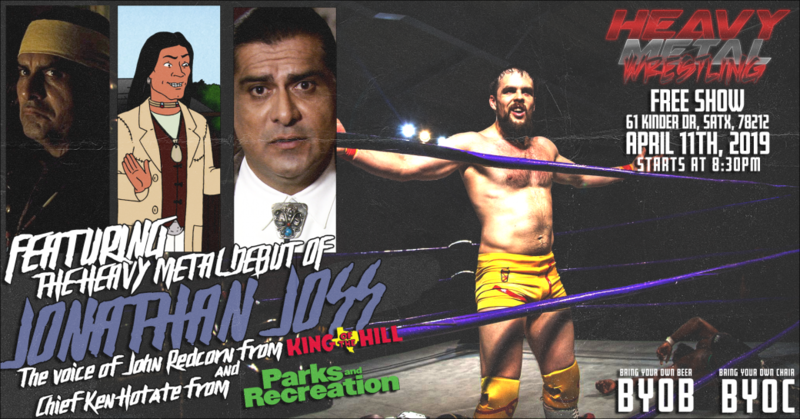 Known as the voice of John Redcorn from “King of the Hill” and Chief Ken Hotate of “Parks And Recreation”, Joss steps foot inside the squared circle for the first time! Be there tonight to see how things shake out! Plus, you never know who will show up! Join us for a very special taping tonight! BYOB, but no glass containers please! Limited seating is available so, BYOC (Bring Your Own Chair) as well! FREE event at Hi-Tones Bar in San Antonio!